Smartphones are now an integral part of almost everyone’s everyday life. They have evolved from being a mere communication device to being a constant digital companion in almost every aspect of our lives. Smartphones have made their way to people’s professional life and have now become an absolute business essential. People have started using smartphones for their professional tasks such as mailing, remainders, attending conferences, working on documents, monitoring, and even as a virtual personal assistant. Smartphones have also paved their way into the networking domain. There are tons of applications out there that enable easy, powerful, and secure networking options over a smartphone. 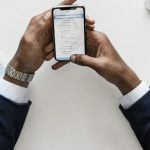 There are several networking functions such as remote access, network monitoring, configuring, testing, and more that can now be easily done using a smartphone. Here are the top five networking applications for smartphones. Fing is a very popular and powerful network application that offers a free network toolkit. The tool’s network scanner can scan any network that the device is connected with and discover all devices connected to that particular network. The app is quick and is very accurate. The tool can provide detailed information about the devices connected to the network and can list details such as device name, model, manufacturer information, IP address, MAC address, and more. The application can also perform several other options such as running Internet and bandwidth speed tests, download and upload speeds analysis, and latency. Here are some of the additional features offered by Fing network tools. Can quickly detect network intruders. Can perform advanced device analysis of NetBIOS, UPnP, and more. Can run Internet speeds and latency tests. Comes with port scanning and DNS lookup features. The application is free to download from Play Store and AppStore. JuiceSSH is a multipurpose terminal client for smartphones and comes with SSH, Local Shell, Telnet, and Mosh support. The application offers a very easy and convenient way to remember both the server IP addresses and credentials, which saves a very considerable amount of time while simplifying logins. Using SSH (Secure Shell Connection) is a preferred means of accessing a remote device that shares the network, and JuiceSSH provides all the required options to do this. JuiceSSH is a fully functional Linux terminal that can be used and operated from your smartphone. The application also supports copy-pasting, clickable URLs, and save credentials and profiles for easy logins. Here are some of the key features of JuiceSSH. Two-factor authentication for added security. zlib compression to improve and stabilize SSH sessions. Easy text zoom options using the volume rockers on a smartphone. This remote desktop feature is very handy when you need to access your desktop or system from a remote location. The remote desktop option was confined only to PCs or laptops until very recently. Now with VNC Viewer — Remote Desktop, users can turn their smartphone into a remote desktop to gain instant access to the other paired devices. In addition to allowing you to control your system remotely, VNC even gives you access to control its mouse and keyboard. Users need to go to VNC’s website and download the VNC client on their devices, which they would like to access remotely. Users can also access a remote PC using the IP address. However, this needs users to log in to VNC Connect with an enterprise subscription. Apart from providing an easy means of remotely accessing systems, VNC Viewer also provides various security features out-of-the-box. 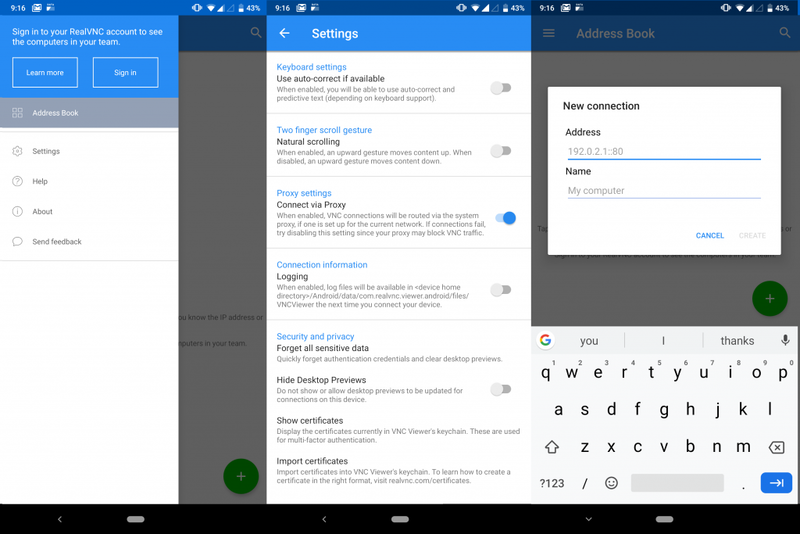 It also supports backup and sync for all the remote connections and devices by signing in. It supports external Bluetooth mouse and keyboard and comes in both free and paid versions with a trail option to check out all the paid version’s features. Network Analyzer is a free and very easy to use multipurpose networking tool available on PlayStore and AppStore. 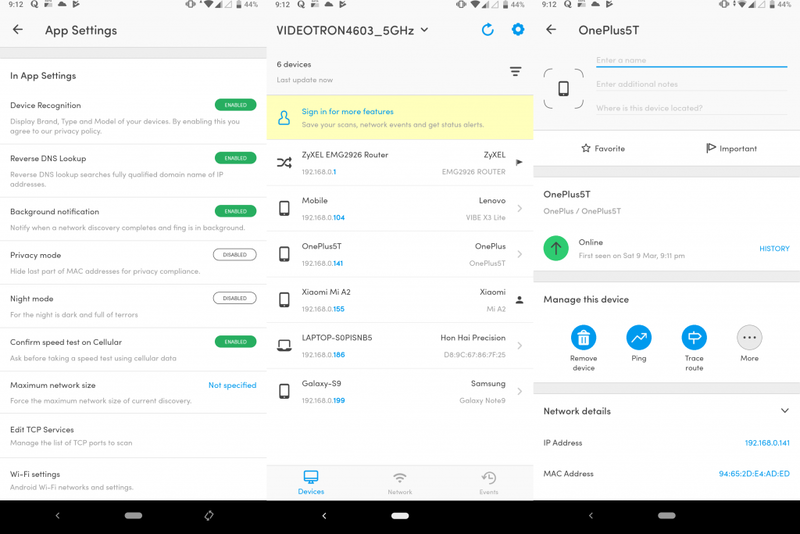 The application can help users diagnose various problems with your network connection. It can also help users diagnose network speeds, remote server issues, and more. As the name suggests, Network Analyzer is meant to analyze your network at home or at the office. 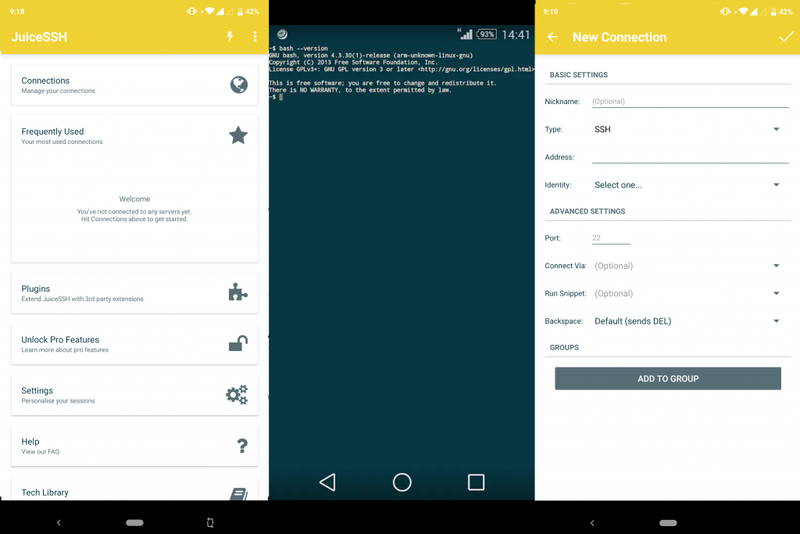 First, the application scans all the devices found on the network and lists their details. Then the application can start pinging the devices found on the network and ping host domains to test them. The application pretty much offers all the features offered by Fing but is a much simpler tool in terms of usage. There is a paid pro variant to the tool — Network Analyzer Pro, which offers more features. 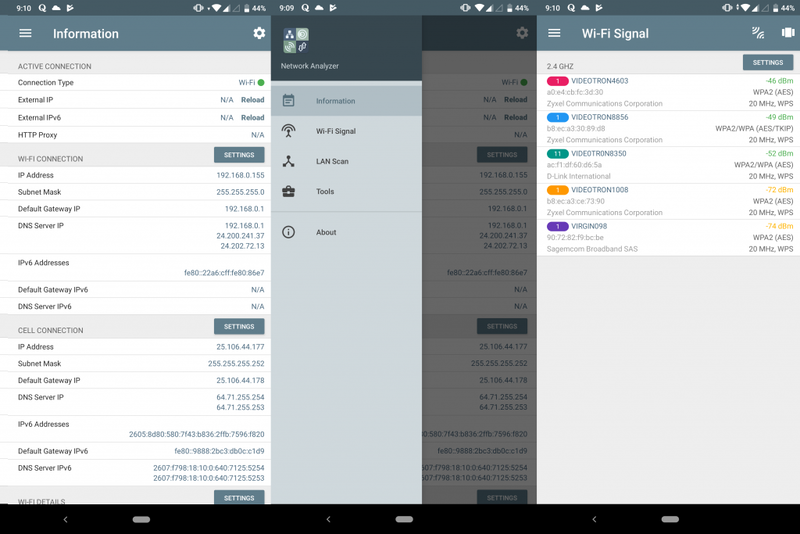 Network Analyzer pro offers WiFi signal meter, LAN scanner, ping and trace out features, Port scanning, Whois, DNS lookup, and other features. 3D Watchdog is more of a personal network monitoring application that counts every type of data usage including 2G, 3G, 4G, and WiFi. The application displays the data usage in various formats including graphs, text, and tabular format. Users can set a limit to usage and the application displays easy to understand and convenient notification icons in green, orange, and red to display the status of the data used with respect to the limit. The application also enables users to set daily limits and plans to efficiently manage network access and data usage. There is paid version that offers further features including advanced data usage prediction, configurable billing rules, and more. Having a smartphone is easy, latching onto a network is even easier, but staying safe in this era of cyberattacks is difficult. With these five network tools, users can have insight into monitoring network connections, status, and devices. 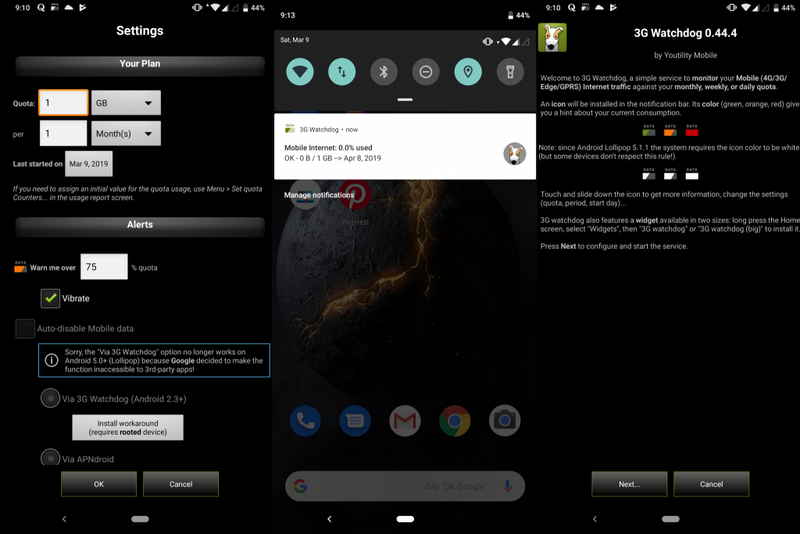 You can also make sure you have secure connections while sending and receiving data over your network.